The show begins with the SGC receiving an unexpected activation of the Stargate from off-world, revealed to be the Kelownan government who want to re-establish relations with the SGC. While O’Neill is still pissed at them for their role in Daniel’s death Hammond and the others are more receptive, seeing it as a vital opportunity to get hold of Naquadria for future hyperdrive technology. The Kelownans send a delegation made up of military commander Hale, ambassador Dreylock, and Jonas’ former boss and friend Dr Kieran. It turns out the reason Kelownan want to get help from the SGC as the other two main forces on their planet have signed a non-aggression pact, a sure sign they’re to declare war on Kelowna, with Kelowna likely to use the now fully weaponised Naquadria bomb. While the delegation goes back Dr Kieran later comes back alone to talk to Jonas, to whom he reveals that he’s working with a Resistance force who aim to topple what they see as the crazed war hungry leadership of the Kelownans. The SGC decide to go ahead with the negotiations while talking with the Resistance on the side. On Kelowna the team are quickly reintroduced to Hale and Dreylock, along with Kelownan leader Valis. It turns out that since the initial tests the Kelownans have uncovered much more Naquadriah than first thought and are willing to trade it for jet fighter technology but the SGC are unwilling to sell offensive technologies given previous dealings with other planets. After the meeting they head to Dr Kierans office to discuss his plans with the Resistance. While he’s unwilling to take them he agrees to talk to the Resistance leadership, who appear well armed and organised, on their behalf that night. That night Valis invites Jonas back to the negotiation room to discuss matters and attempts to compel him to come back into the fold and to spy on Dr Kieran which Jonas refuses. After negotiations continue to go badly SG-1 instead focus on the Resistance angle after Kieran promises they’ll move within two days as more and more Resistance scientists are being rounded up but require the SGC to take over the Government building for them as they have the best shot via the Stargate, claiming it’ll be worth their while as he’s been smuggling Naquadria to the Resistance for the last few months. Kieran attempts to reach the Resistance base again, being rescued by Jonas when he comes under attack from security forces, falling from a ledge in the process. Dr Kieran is moved to the SGC for recovery, who don’t buy the Kelownan line that they found him alone in the street, with Jonas keeping his participation in the fight with the security forces a secret. The team minus Jonas head back to the planet to locate the supposed Resistance base, finding that the place is empty save for a small stockpile of Naquadria. To cover for them Jonas once again attempts to convince the Kelownan leadership to avoid all-out war with the others on the planet. Meanwhile at the SGC Fraiser diagnoses Kieran with a form of severe Schizophrenia that would explain his paranoia and the visions of Jonas who was never there during the fight. It turns out that Kieran’s exposure to the Naquadria had caused his mental illness, the resulting paranoia and delusions turning into his beliefs of a Resistance that didn’t exist and that the scientists that had ‘disappeared’ had been placed into mental health facilities due to their similar illnesses. Before Kieran is placed into full-time psychiatric care Jonas visits him one more time finding just how far his one-time mentor has fallen into his delusional state, now believing that the Resistance has operatives on Earth keeping in contact with him. While saddened by his friend’s state Jonas assures him that his attempts to stop the bomb project saved the world. Shadow Play is probably one of my favourite straight episodes of season six and the show as a whole. While it once again starts in the same old conspiracy way it pulls a lot from the show’s previous history with intrigue and takes inspiration from real life events such as the Cold War. The plot of the episode is a fun tale of political intrigue and nuclear secrets played for once on another planet, specifically Jonas’ homeworld. Here we see the team supposedly take part in a coup against the country’s government, only to find that all along it’s been a delusion. Many different strands in the episode tie together within the genre, with secretive meetings where people discuss spying on others, gunfights with security forces, and a rebellion by the people against a sadistic regime. Throughout the episode this initially obvious setup is increasingly blurred between black and white and ends up becoming more grey than anything else with the SGC openly using the negotiations to help the overthrow and acquire resources for advanced technology, the Kelownans being more desperate than evil in their actions, and loyalties being tested. In the end however it becomes clear that while the threat of war is real the fifth columnists are not. The setup of the episode is also used to great effect to enhance the themes of the episode, with secret meetings taking place where characters are half in shadow, disused warehouses providing cover for the rebellion, and people hiding in alleyways and backstreets. All of these things add a sinister edge to what’s going on when compared to the brightly lit conference meetings that host the initial negotiations, separating the public and private events of the episode. Dr Kieran is presented as one of the more sympathetic characters on the show, here the victim and not even knowing it. Until the last second we believe that he’s truly an agent of the Resistance, aiming to stop an evil government before it’s all revealed that he’s a mentally ill old man who is slowly losing his mind to it. What makes it all the more tragic is that his concerns about proliferation of WMDs and their destructive power are real, along with his concern for his colleagues who he thought had been eliminated when really they were quietly placed into care for similar illnesses. The fact it was his own genius and skills in the bomb project that caused the disease isn’t lost in the episode, as almost a cruel display of the more lingering effects the use of the weapon would have other than its raw destruction alone. Dr Kieran’s desire to prevent the use of the weapon is a reflection of the scientific establishment after Trinity and later the use of The Bomb on Japan during the 40s where many argued that it should be dismantled despite knowing that they couldn’t put the force they created back in the bottle. In fact many of the most critical would be publicly humiliated during McCarthyism of the 50s to silence the condemnation of the atomic weapons program. In term of the references within the show itself it makes liberal use of the earlier episode The Other Side where earlier and more liberal help from the SGC saw them almost supporting a genocidal regime due to being blinded by the technology advances they had. Here the deal is much more conservative, at all costs avoiding the selling of anything that could be used militarily in either offence or defence. Overall the episode is a thrilling one with a great setup surrounding a Cold War intrigue while also referencing not only the show’s darker past but also the real life issues surrounding the research of WMDs in reality. · Valis’ jewellery almost looks like a Bollo tie. · The map of Kelownan is really just a horizontally reversed image of the top of Italy and the Balkans. 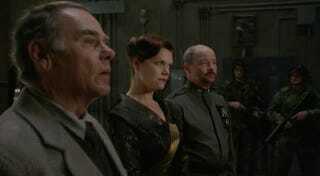 We start on a Goa’uld occupied world where a minor Goa’uld orders his Jaffa to capture SG-1. On a desert planet elsewhere a science team are attempting to study a ring transporter left in the dirt but are slowed by one of their members, Dr. Felger, being obsessed with SG-1 who are monitoring them much to the annoyance of everyone else. The base is suddenly attacked however by a Jaffa attack force, with SG-1 being captured in the process. Despite having been ordered by O’Neill to stay low and report back to the SGC Felger decides to use the ring transport to go and rescue SG-1, taking another scientist Coombs along with him. On the Goa’uld ship SG-1 are noticeably not trying to escape, waiting to be confronted by a stereotypical Jaffa intimidation this time from Anubis’s First Prime Her’ak who boasts about having captured them. After arriving on the ship, and Felger randomly emptying his pistol into the room, the two attempt to navigate the ship via the airducts in a bid to rescue SG-1. After emerging into a corridor near the prison cells the team catch their attention as they clumsily walk past a hatch in the cell. Despite Felger’s belief he was helping he is instead confronted by a pissed O’Neill who reveals they were intentionally captured as part of a mission with the Tok’ra. It turns out the Goa’uld from the beginning, Khonsu, is really a secret Tok’ra operative and this was the only way to get his information without arousing suspicion. The team are later contacted by Free Jaffa on the ship who help the team out by hiding the two stray scientists until they can be freed later. Arriving at Khonsu’s base the team are placed in lockdown until they can meet with the Goa’uld, with O’Neill still trying to get a reaction from Her’ak. While everything is appearing to go to plan Felger and Coombs witness the previously encountered Free Jaffa murdered by others, realising that the plan must have been detected somehow. The two scientists decide to dress as the Jaffa and make their way to the planet, managing to somehow trick their way through the guards around the Gate and make it to the base proper. Later in the throne room Her’ak executes Khonsu, revealing that he knew all along Khonsu was a Tok’ra. Her’ak, now leading the base, brings SG-1 to him and attempts to learn more information about their mission before being sent away when it becomes clear they know nothing. With no help coming from the SGC Felger and Coombs are SG-1s last hope, with the two locating a control room and attempt to free the team from their prison. Felger is able to successfully unlock the door, helping the team to retrieve their confiscated equipment, while Coombs leads them out of the base itself. While the team are able to secure the Gate Coombs becomes trapped in the base as his only exit is blocked by an army of Jaffa, forcing O’Neill and Teal’c to go back and rescue him with them all barely escaping before Anubis arrives. Sometime later at the SGC to two scientists are presented with awards for valour as a result of their rescue mission, with Felger getting to kiss Carter. This is revealed to be a daydream by Felger which Coombs snaps him out of, with it not being made clear just how much of what we just watched was a daydream. The Other Guys is one of my favourite of the deliberately self-mockery episodes on the show. Unlike others however the target isn’t so much the show but rather lightly ribbing the fans instead. The characters of Felger and Coombs are obvious standins for the fans of the show, with Felger being the annoying fan who wants to take part in SG-1s adventures while Coombs is more distant and knows he wouldn’t survive. Felger’s desperation to be “one of the team” gets the two of them in increasingly more dangerous episodes throughout the episode but they keep making their ways out through more and more ludicrous means, such as navigating an unknown building and cracking an alien computer much like the team do on a weekly basis. This obvious skill at something completely new is why I can’t help but think this episode should’ve been entirely a daydream of his as it’s just so stupid and more fun that way. The episode also makes quite explicit nods to nerdiness by endlessly referencing the Star Trek fandom. Coombs constantly makes references to the franchise and the Tok’ra in the episode is a clear reference to the “Redshirt” cliché from the show, where one-off crewmembers would be offed constantly to increase the drama levels. The fact that Stargate owes a lot to shows like Trek isn’t lost to the creators clearly. Outside of this the episode is just constant fun with O’Neill ridiculing everyone in more explicit ways than usual with him openly trying to provoke a reaction from the main antagonist, going so far as to mock his use of grammar at one point. It’s the complete lack of seriousness in the episode that makes it so wonderful to watch, especially as the team constantly facepalm at the actions of Felger, who was wondering around a Ha’tak while talking incredibly loudly. Overall the episode is stupid, silly, and fun. The plot makes no sense but it doesn’t have to in this case, with the viewer willing to watch two bumbling scientists use fake accents to fool a guard because in the daydream it’d make perfect sense and in this case that’s what it is, almost every fan’s daydream of being a member of SG-1 itself. · Those doors ain’t half easy to break down. · Surprised they have so many MREs on hand given how the Stargate is right there anyway.